January sales of American Eagles soared to record or multi-month highs as increased demand for precious metals and the release of 2013-dated bullion coins attracted aggressive buying. Not only was there no better January in the American Silver Eagle’s 27-year history, there was no better month. 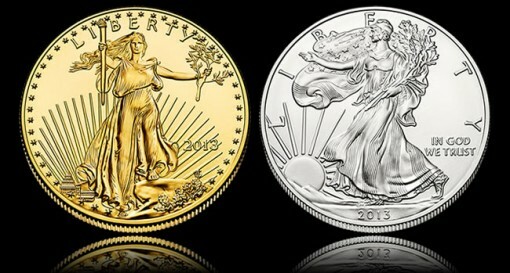 As for American Gold Eagles, more sold than in any other month in the past two and a half years. January sales of American Eagle silver coins scored a monthly record of 7,498,000. Nearly 1.5 million of the total came from the final week, and that pushed sales over the previous all-time monthly high of 6,422,000 from January 2011 and above the now third highest monthly total of 6,107,000 from January 2012. Volatile but higher trending silver prices had a hand in increasing coin demand last month — silver futures rallied 3.7% and the London silver Fix jumped 6.9%. Silver Eagle availability or lack thereof, was another aspect driving sales. Last year’s American Eagle silver coins sold out on Dec. 17 and buyers had to wait until Jan. 7 for the release of new 2013-dated issues. As a result, sales that would have normally occurred toward the end of 2012 pushed forward to early January, and in greater numbers due to pent-up demand. January historically trends strong for American bullion coins anyway as both investors and collectors place orders early to get coins with new dates. Knowing this, the U.S. Mint began producing and building its supply of 2013-dated Silver Eagles right after Thanksgiving. The resulting stockpiles were still too small, as it turns out. Orders for the new bullion coins between Jan. 7 and Jan. 17 reached 6,107,000, exhausting U.S. Mint inventories and triggering a more than one-week sales suspension that lasted until the 28th. From one perspective, last month’s record shines brighter since it happened in about two weeks of green-lighted sales from Jan. 7 through Jan. 17 and then again between Jan. 28 and Jan 31. From another point of view, the 7.498 million figure is a bit less spectacular since it also represents Silver Eagle orders fulfilled between a longer period of between Dec. 18 and Jan. 31, or 45 days. February, lacking similar factors, will log significantly lower sales. Especially if the U.S. Mint continues to ration Silver Eagle orders. January sales of American Eagle bullion coins totaled 150,000 ounces for the highest monthly total since 152,000 ounces moved in July 2010. Gold prices during the time were less volatile than silver, but uncertain at best. For the month, New York gold futures fell 0.8% while the London gold Fix inched up 75 cents, or less than 0.1%. U.S. Mint distributors order every American Gold Eagle size. These include the one ounce, one-half ounce, one-quarter ounce and one-tenth ounce. In notable comparisons, sales in January nearly doubled December’s 76,000 ounces and they shot ahead 18.1% from the level one year ago of 127,000 ounces. January sales of American Buffalo gold coins reached 72,500 ounces for the strongest monthly total since the 116,500 ounces in October 2009. The amount is nine times higher than sales of 8,000 ounces in December and more than five times the 13,500 ounces sold a year ago. Finally, January sales of America the Beautiful Five Ounce Silver Bullion Coins reached 28,960 coins for 144,800 ounces, easily out-pacing every month last year. The U.S. Mint offered its distributors a discount on older 2011-dated coins. That boosted their sales as they were the only coins moving forward for the month. The U.S. Mint is now striking the first two issues for this year, but has not started selling them. Below is a breakdown of the latest U.S. Mint bullion coin sales by product type. For comparative purposes, added are monthly sales totals from a year ago and for December. All sales above are in number of coins sold, not in the amount of ounces.